Hugo Boss' eyewear collections are created for people who like their clothes and accessories to let their personality shine through. The brand might be best known for its exquisite men's suits, but Hugo Boss represents the finest in German design when it comes to glasses as well. 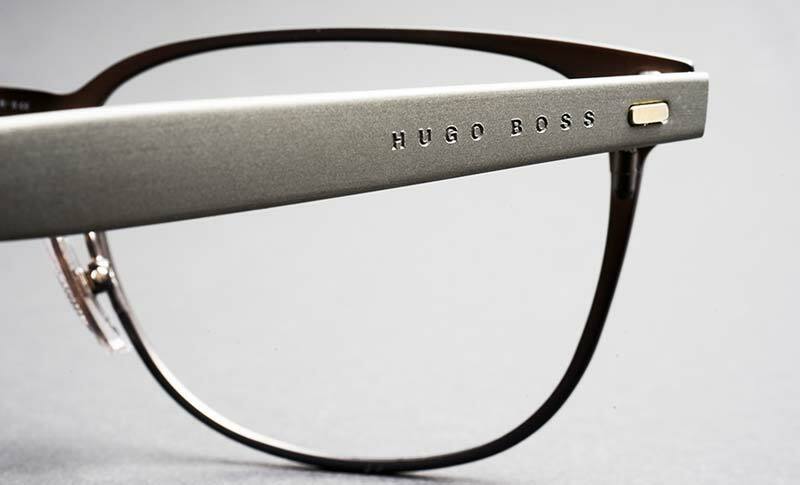 A typical Hugo Boss frame is discreet, but with a distinctly recognizable aesthetic. Classic lines are subtly complemented by tiny eccentric elements. High-tech materials and elaborate details emphasize the luxurious quality of every collection, while never compromising on comfort and functionality. Elegance, refinement, stability and solidity are the leitmotifs of Hugo Boss' designers. With a pair of Hugo Boss glasses, you're ready for any occasion. In 1923, the tailor and entrepreneur Hugo Ferdinand Boss set up a clothing store in Metzingen, a small town south of Stuttgart where the fashion house still has its head office. The following year, the company established its first factory. By the 1930s, Hugo Boss had become a major supplier of uniforms to the postal and rail services, but also to the German military and party organizations. When Hugo Boss died in 1948, his son-in-law took over the company, and the business gradually shifted from uniforms and workwear to more exclusive men's confectionery. Focused brand building started in the 1970s, which also marked the start of the company's long-term association with motorsport. Hugo Boss has been a sponsor for Formula 1 driver Niki Lauda, and later for the McLaren Racing team. The fashion house has continuously expanded its range of clothing, shoes and accessories, and the first sunglasses embossed with the Hugo Boss logo saw the light of day in 1989. In the Extra Optical online store, you'll find a hand-picked selection of Hugo Boss frames, for women and for men. These glasses are part of our premium range, but thanks to online shopping and efficient business processes, we can offer this exclusive eyewear at ultra-competitive prices. Click through to our online store and select your favorite look. Our system will recommend the ideal type of lens based your prescription values, but you can also upgrade to thinner lenses for extra-light glasses. Most Hugo Boss frames have a good height and are perfectly suited for progressive lenses. We want you to love the eyewear you buy from us, every time. So, if for any reason you aren't 100% satisfied with your Hugo Boss glasses, you can return them within 30 days and get a replacement or a refund. Ready for the perfect eyewear shopping experience? Order today!